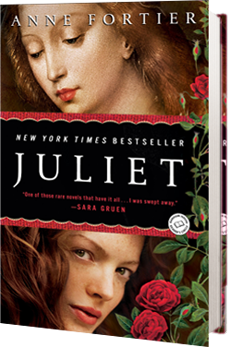 Juliet, an ambitious, utterly engaging historical novel on the scale of The Thirteenth Tale and The Birth of Venus, follows a young woman who discovers that her family’s origins reach all the way back to literature’s greatest star-crossed lovers. When Julie Jacobs inherits a key to a safety-deposit box in Siena, Italy, she is told it will lead her to an old family treasure. Soon she is launched on a winding and perilous journey into the history of her ancestor Giulietta, whose legendary love for a young man named Romeo rocked the foundations of medieval Siena. As Julie crosses paths with the descendants of the families involved in Shakespeare’s unforgettable blood feud, she begins to realize that the notorious curse—“A plague on both your houses!”—is still at work, and that she is the next target. It seems that the only one who can save Julie from her fate is Romeo—but where is he?